Pensacola was first settled by the Spanish in 1539. Tristan de Luna had founded a colony in 1559 which lasted for two years. (A hurricane sank his supply fleet and they all decided to leave!) But the first permanent settling was not until 1698 when Spain decided it needed more protection from the encroaching French. In 1719 the French took Pensacola! But, they promptly gave it back in an exchange (for New Orleans?) designed to lessen the British toehold in the Gulf area. By then Spain owned only the part of West Florida up to Mobile Bay. The French owned the rest (to about the present Texas border!). 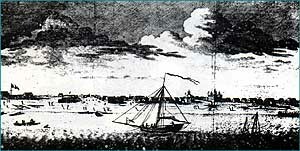 1763 illustration of the British fleet in Pensacola. At this point in history the city was under British control and had moved to its present location. In 1763 Spain had to have Havana, Cuba. So they traded the wilderness Floridas (East and West) to Britain for Cuba. Recall the importance of Havana; it was the staging point for all those treasure galleons from Meso-America on their way to Spain! At a time when Spain was outfitting one of their best for an invasion of Pensacola, the British counterpart was busy fussing over lack of funds and no quality workers for his Forts. He was also asking for a "transfer" out of the place. The Spaniard, Gov. Gen. Bernardo Galvez y Gallardo, conde de Galvez, had just completed a very successful campaign against the English in New Orleans, Natchez, and Baton Rouge. Indeed, this leader showed his brilliance from the outset of this campaign. As Galvez had his 14 ships ready to attack at Baton Rouge (1779), a great storm struck sinking most of his ships and destroying their provisions. Undaunted, he recovered cannon from the sunken ships, built a shore battery, and attacked the fort. He succeeded where lesser leaders would have confessed failure. A lesser leader was present at Pensacola in the English general as he was still writing letters and complaining. He had made a weak attempt to help the troops on the Louisiana coast, but he sent so few of his own troops with such weak instructions they were quickly dispatched. Even as the Spanish fleet massed off Santa Rosa Island the English general did not believe they would attack. He failed to grasp the importance of Pensacola as the key to Naval supremacy in the Gulf of Mexico. Galvez had a firm grasp of this key fact. In March 1781 when Galvez landed his troops on Santa Rosa Island it must have been an awesome sight. There were those great ships-of-the-line (the really big "Wooden Walls", Frigates, and a number of smaller recently captured vessels used as lighters to land provisions and troops onto the beach. Perhaps more than 40 ships! Some 1400 troops were landed onto Santa Rosa Island. When Galvez's ships first massed for the entrance into the harbor, a hurricane struck! Great skill in fleet handling and, pre-planning for such, took the large number of ships out to sea for protection and then quickly back on station still ready to "run the guns" of the Royal Navy Redoubt (fort) at Red Cliffs (about 7 miles SW of Pensacola) with minimal losses. But to get a ship's Captain to run in under those guns FIRST was another thing. Galvez personally took command of a small ship (the brig Galveztown) and led the others under the guns by first going through alone. In doing so he had exposed a big flaw in the design of the batteries on the Red Cliffs fort. Although some 140 heavy shot had been fired from the fort the fleet suffered little damage. The big guns could not be lowered enough to hit ships very near them! The English General had miscalculated? Galvez's ship soon fired on the small Fort Half Moon and struck the powder magazine. That brought him his first prisoners; some 1100 English troops. 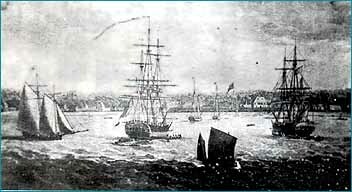 His men captured several English sloops, 2 small warships and a frigate, the Port Royal (the English burned the frigate Mentor to avoid it's capture!). With all these ships in skirmishing actions, some have written of the Naval victory at Pensacola. It was strictly a land victory with the Navy there in large numbers to protect against English reinforcements from the sea. In April 20 more warships arrived. These included some 5 French warships and brought needed supplies and 1600 more men. The siege of Pensacola was underway. Galvez' brilliant tactics shown forth once again. He had his men build a covered trench large enough to move mortars and cannon through the "tunnel" without being damaged by the English cannon fire from the main fort, Fort George. He soon had a redoubt built behind a dune (Pine Hill) at the end of this "tunnel" which contained 6 twenty-four pounder cannons and 4 13inch mortars, certainly ample and close in enough to worry a fort! The covered trench was extended to another point and a similar setup produced. Finally one of the shots from this little redoubt struck the last cannon in the small Queen's Fort and ended it. The English General threw in the towel, or rather called for a truce during which he offered to surrender. Although he, his troops, and all their families along with their transportable personal possessions, were allowed to either just leave or were provided ship passage (Troops were even allowed to carry their personal arms with them!) to other ports by the very honorable Galvez. One of those having to leave was the Governor of West Florida. It seems West Florida had been surrendered to Galvez. Once again that part of Florida was Spanish! 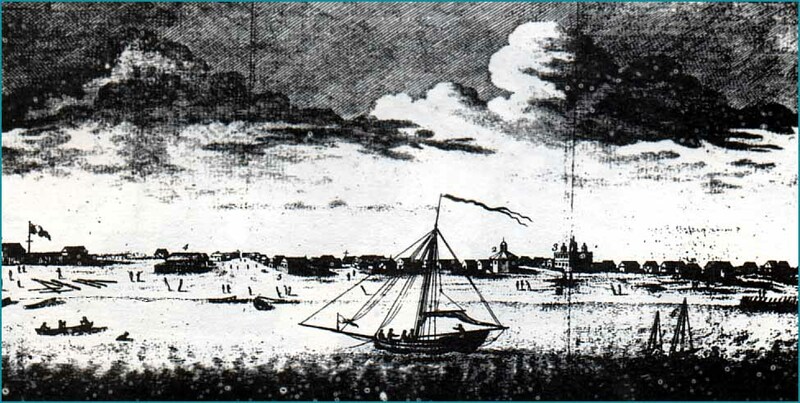 In 1783 England relinquished any claims it had remaining to the Floridas in trade for the Bahamas. Florida was all Spanish again. Of course the good news for the Colonies was that, in one more spot, there would be no chance of English reinforcements from Florida, the Gulf or up the Mississippi! This should give one an idea why the Battle for Pensacola is considered to be one of the important Revolutionary War battles even though no Colonists were involved. It may well have been one of those turning point battles. A most interesting note here is the manner in which Galvez ordered the people of the West Florida area to be treated. His instructions for dealing with the indigenous people is a marvel in itself. We might have had a much better history book to read concerning how the "Indian Situation" was handled if Galvez' instructions had been followed throughout the Americas.